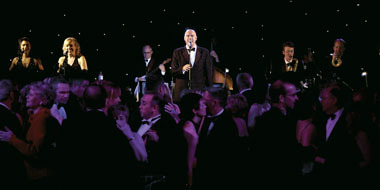 In 2004 Craig combined his floorshow with three actors from the award winning "Rat Pack Confidential" from London's West End. Together they opened the new Madinat Theatre in the 6-star Madinat Jumeriah Hotel, Dubai with a spectacular Rat Pack tribute show. The show was a sell-out run away success and now Frank, Dean & Sammy… and Craig, can appear for you with the 7-piece That Swing Thang plus singers or the 17-piece Big Band plus singers.